One of my new year’s goals (I don’t like resolutions!) was to make more bread. I started off with a simple farmhouse bread, but I found that it dried out really fast so I figured I should try making buns instead. I was all set to make my mother-in-law’s famous “special buns”, as the kids call them, that she makes for holiday meals…but Braden got sick the day I was going to make them with her so I kind of put that notion to the side and forgot about it. Then I was flipping though a recipe book around seeding time this spring, and came across potato rolls. I made them, everyone loved them, so I stuck with it! One question I get asked often about our farm, is whether or not we eat the food we grow. We can’t use canola seeds for anything since they need to be processed into oil at a crushing plant, we do eat our yellow peas in the field when they’re ripe for a snack, but I’ve never used our wheat for anything…until now! I got a grain mill for my birthday and I finally used it to make our very own home grown whole wheat flour! 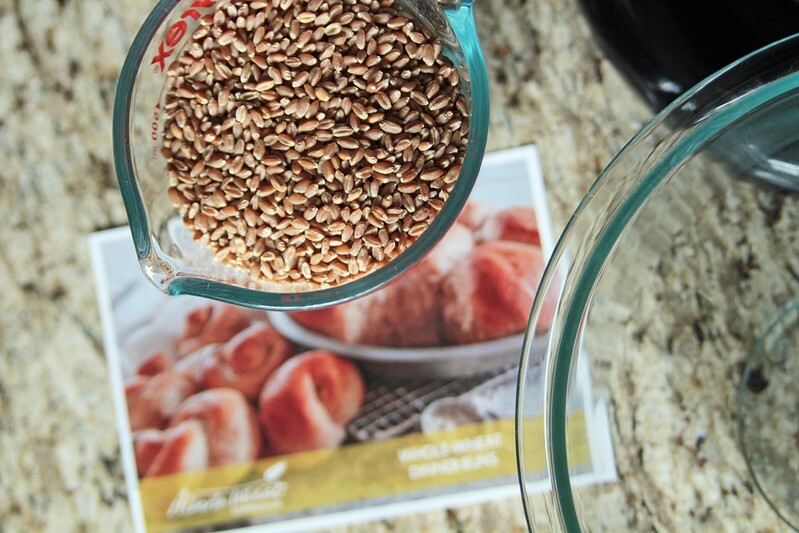 *If you are milling your own wheat, like I did, you need about 1½ cups of cleaned wheat seeds/wheat berries (fancy name for wheat seeds!) 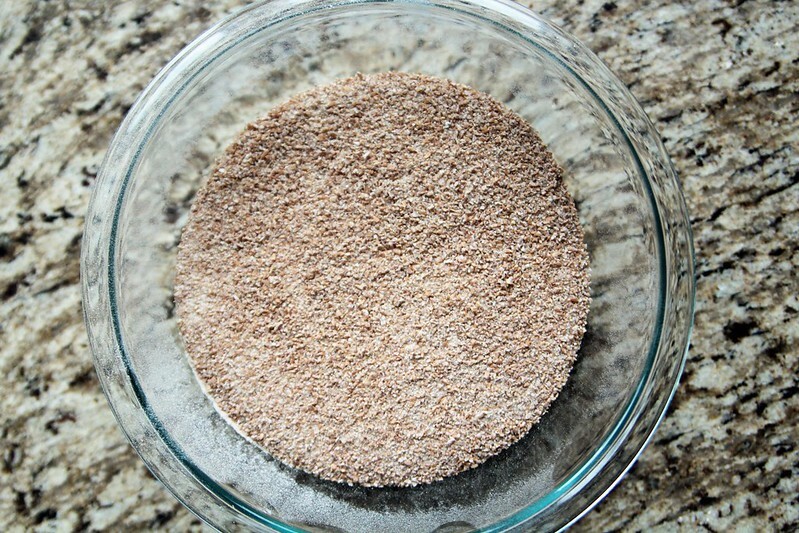 to grind into 2 cups of whole wheat flour. This was my first time milling my own flour and even on the finest setting, it was still pretty course, but for the price of my grain mill and for my needs, I thought it did a great job! First things first: in a mixing bowl, or your stand-mixer bowl, stir the water and the sugar together and sprinkle yeast on top. Cover with a tea towel and let sit for about 10 minutes until mixture is frothy. 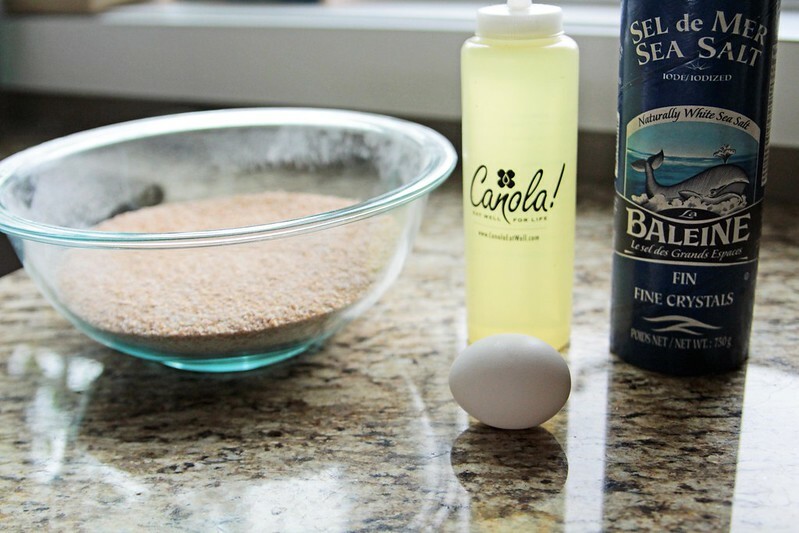 In a small bowl, beat the egg, canola oil and salt together and then stir into the yeast mixture. 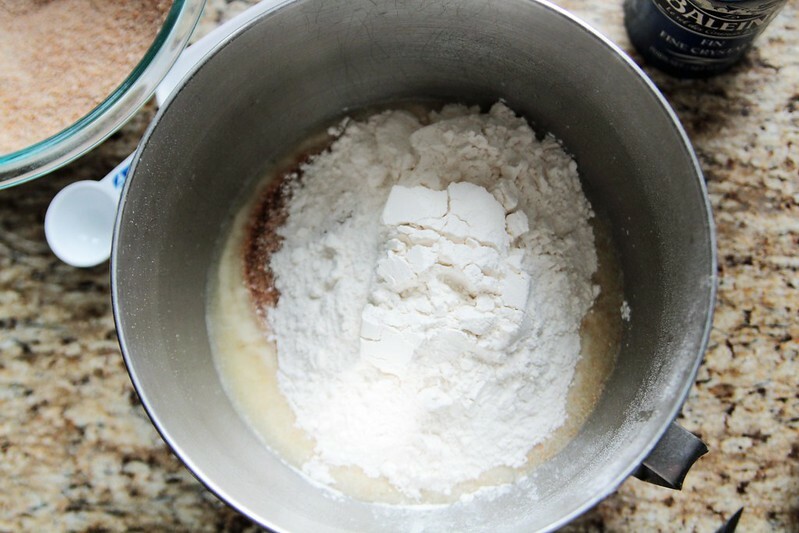 Add 2 cups of all-purpose flour and 2 cups of whole wheat flour to mixing bowl an mix until the flour is well combined. (I use the dough hook on my stand mixer for this!). Add the remaining all-purpose flour (½ cup per the original recipe, but I needed almost another 1 cup total), until dough is formed and feels elastic and smooth, about 5 minutes. Next, divide your dough into 2 pieces, then half those pieces for 4 pieces and cut those quarter pieces into 3 for a total of 12. I like to use my Pampered Chef plastic/nylon knife so it cuts the dough but not my silicone rolling mat; a pizza roller works well too. 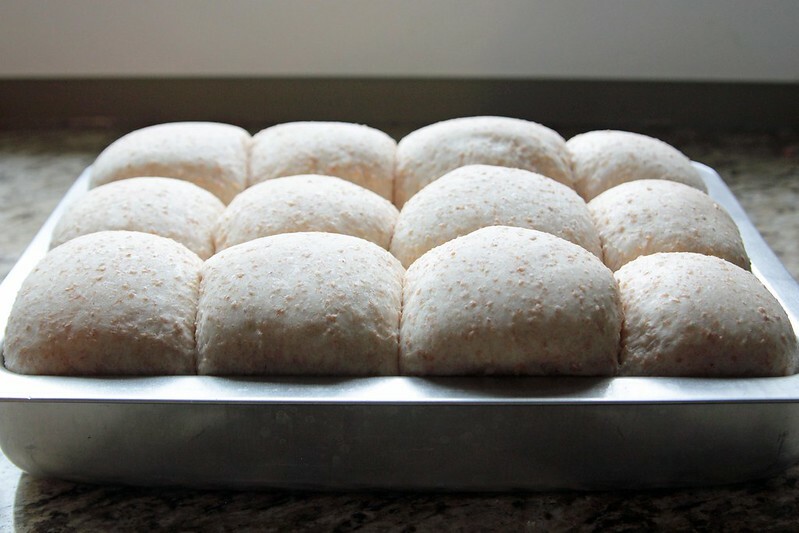 Next, gently pull each piece of dough into a ball by tucking the edges under to make the tops nice and smooth, you can see how I do this here. Spray a 9×13 pan or a cookie sheet with canola oil and place all 12 pieces in/on and cover with a clean tea towel in a non-drafty and warm spot for about 1.5 hours. I like big buns and I cannot lie! Near the end of the rising time you can preheat your oven to 350ºF. When it’s time to cook, put them in heated oven for 20-25 minutes until tops are golden brown and when tapped the buns sound slightly hollow. 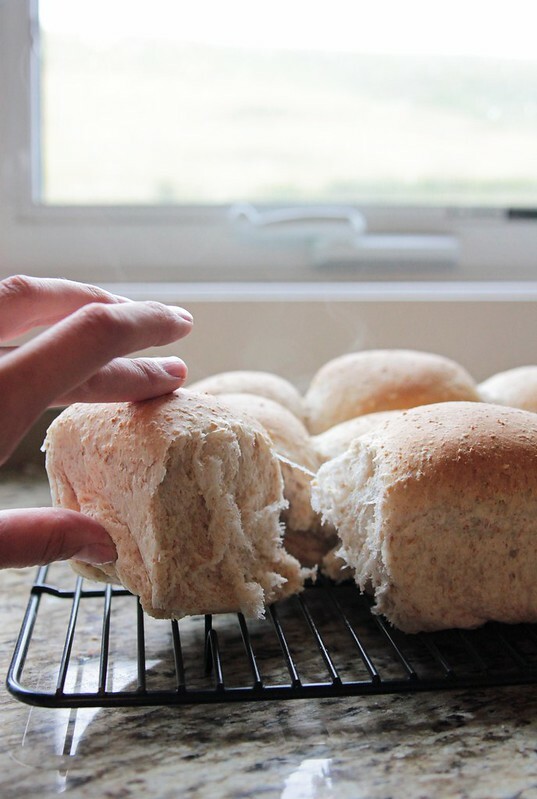 Immediately turn onto cooling rack and enjoy the smell of fresh baked buns! 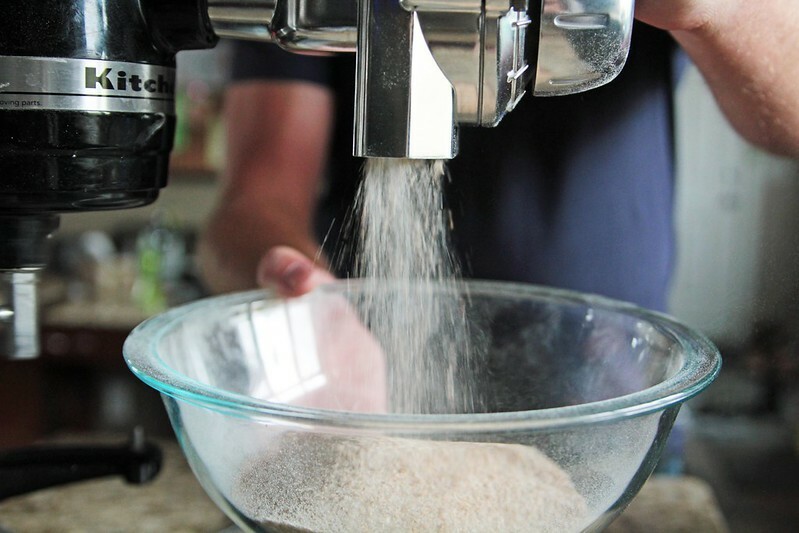 In a mixing bowl or stand-mixer bowl stir water and sugar together and sprinkle yeast on top of water. Cover and let sit for about 10 minutes until mixture is frothy. In a small bowl, beat the egg, canola oil and salt together and then stir into yeast mixture. Add 2 cups all-purpose flour and 2 cups whole wheat flour and mix until flour combined or use dough hook on stand mixer until well combined. 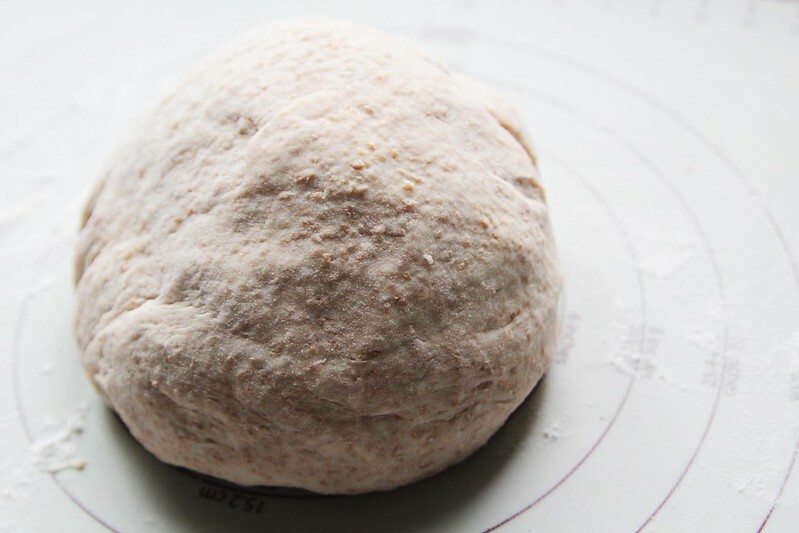 Add remaining all-purpose flour (1/2 - 1 cup) until dough is formed and feels elastic and smooth; about 5 minutes. 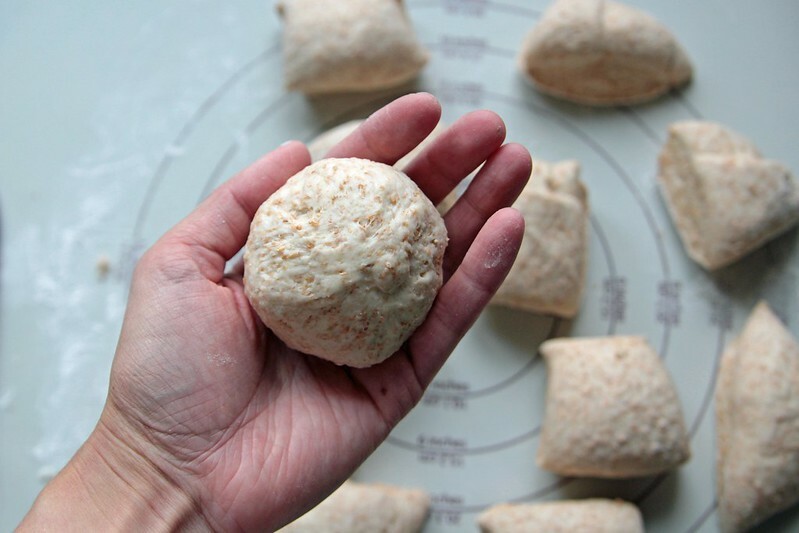 Divide dough in 2 pieces; each piece into 2 for a total of 4 piece; cut each quarter into 3. Pull dough from top of piece to the bottom and pinch together until top is round and place in greased 9x13 baking pan or greased cookie sheet. 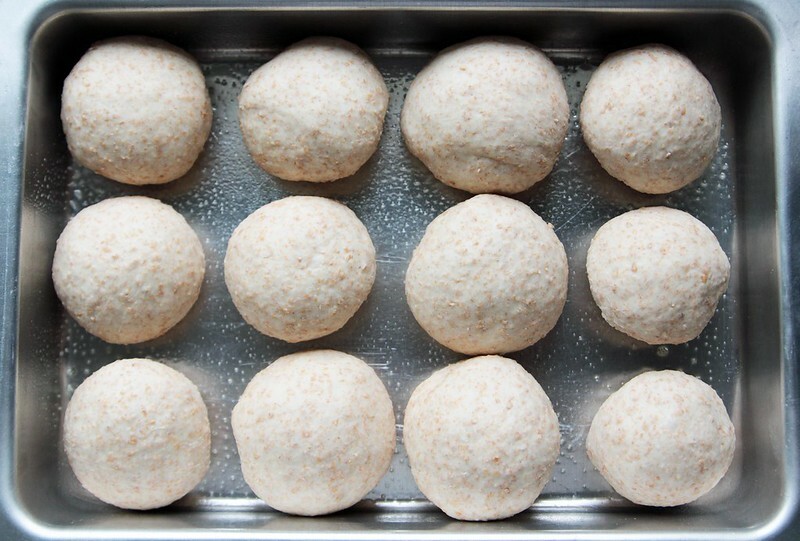 Repeat for other 11 balls of dough. Cover with clean tea towel in warm area free of drafts and let rise for 1.5 hours. Preheat oven to 350F and then place buns in oven for 20-25 minutes until tops are golden brown and when tapped the buns sound slightly hollow. 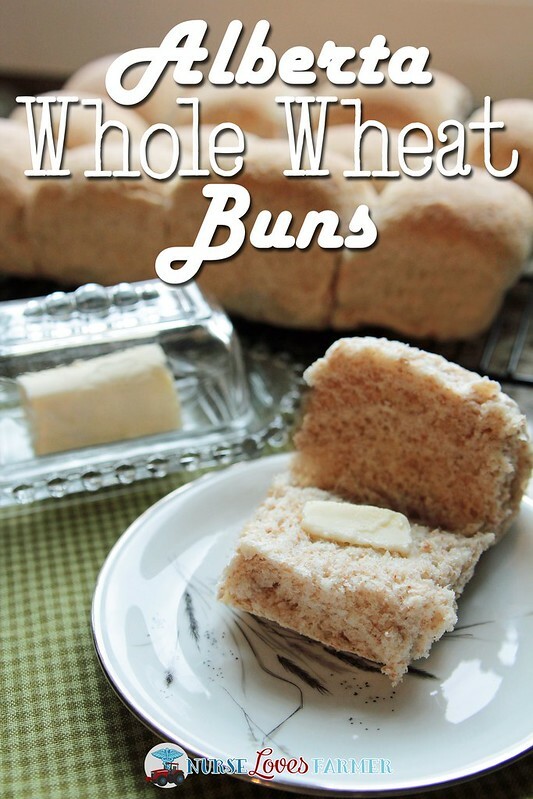 Turn buns onto cooling rack immediately. 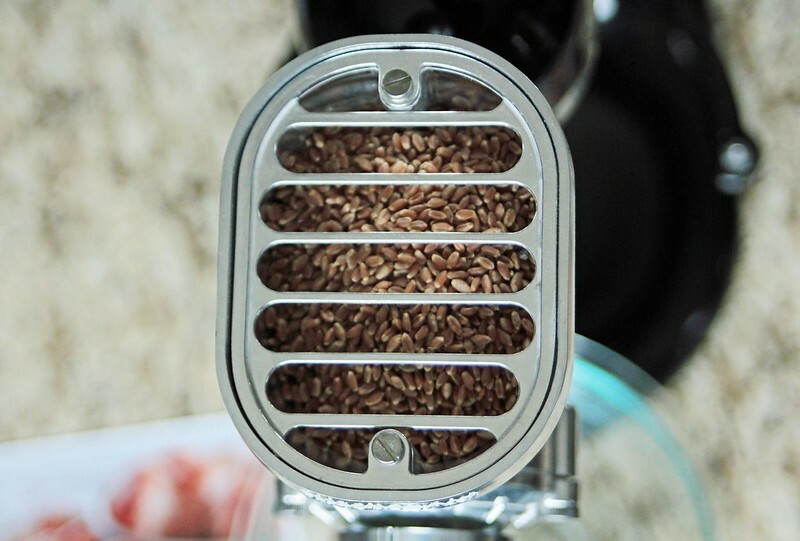 If grinding own flour, mill about 1.5 cups of clean wheat seeds (wheat berries). 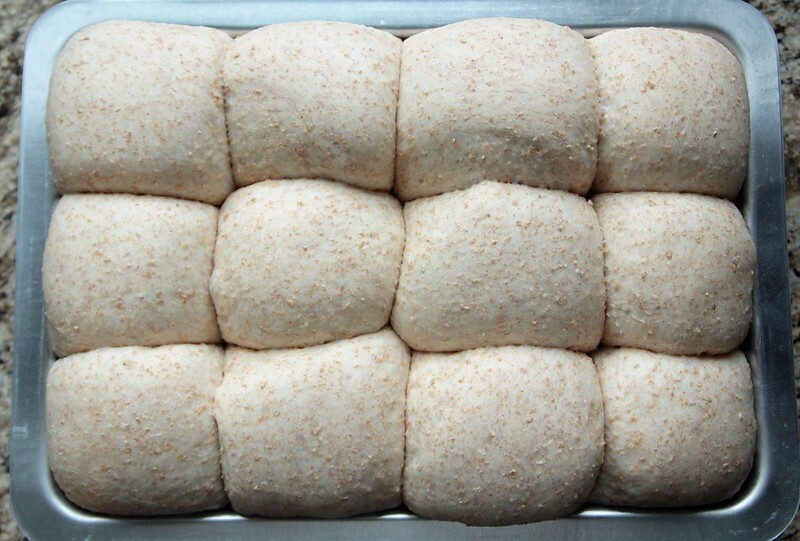 If making 12 buns, they will be very big, consider dividing into 24 for smaller portions. These buns were a huge hit! 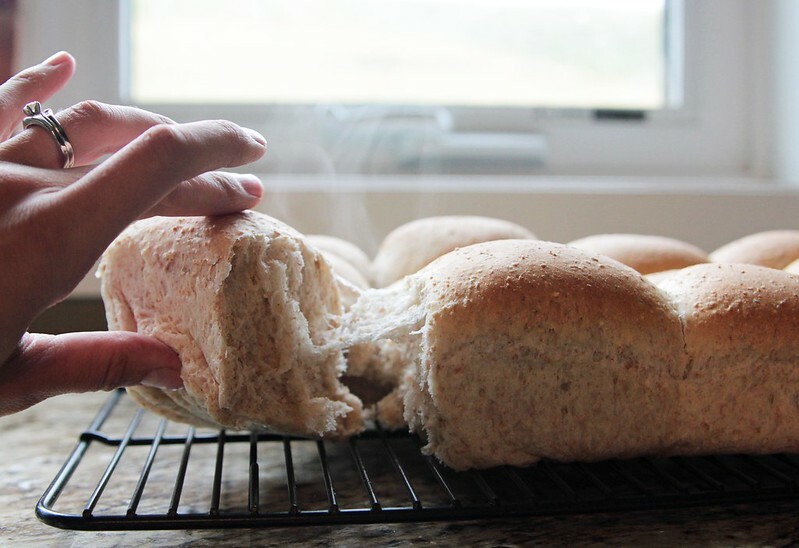 They are definitely more dense than a traditional dinner roll, because of the whole wheat flour, but just think of all that extra nutrition and fibre that’s packed in there! I always make a recipe (mostly) following the exact steps, so as suggested I made 12 rolls for this recipe. 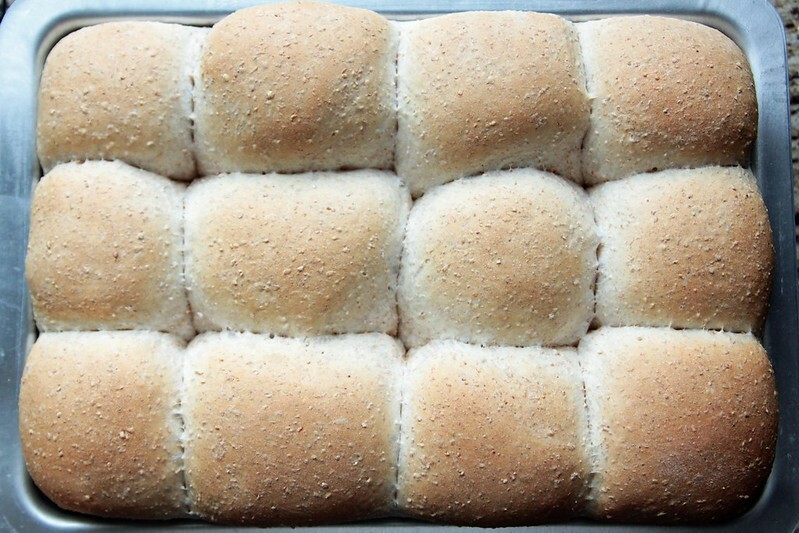 If I make them as dinner rolls again, I will make 24 rolls on a big baking sheet, like I do for my potato rolls, however if I make them for sandwich buns (my farmer wants me to make them for sub buns too), I will make them larger like this. There you have it, we officially eat our own wheat. « Braden is 5.5 Years Old! So good! 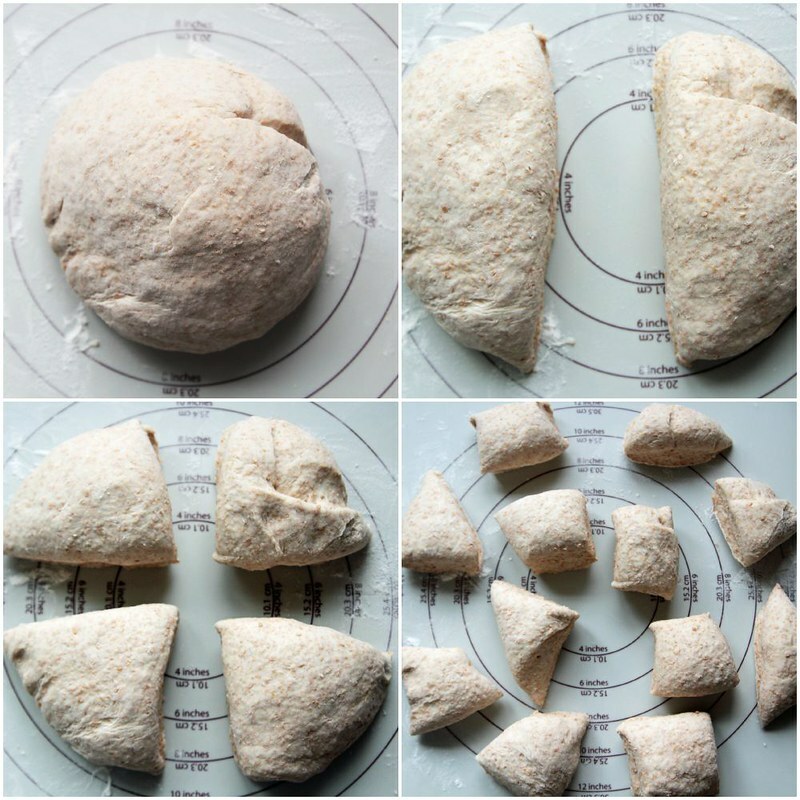 I only had regular yeast – so I let them rise for about 3 1/2 hours. Worked great! These are fantastic & so simple to make. I have failed many times making buns, but these turned out perfect the very first try. I did end up making the smaller the buns the second time around as I found the dozen sized buns were a little too big for us. Oh I'm glad you made them and liked them, and I agree — they are so easy to make and you don't need to wait for multiple rises. I just made these into sub buns for the farmers' lunches and I have some tinkering to do with size, but they love them!